Oklahoma City Self Storage at 9111 N. MacArthur Blvd. Located near the intersection of N. MacArthur Blvd. 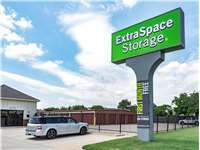 and W. Britton Rd., Extra Space Storage serves Oklahoma City residents near Lake Hefner, Nichols Hills, The Village, Bethany, and Woodlawn Park. Locals will recognize our facility near North MacArthur Church of Christ and 7-Eleven. We're also accessible for residents of nearby apartments, such as Stonebrook Apartments, Village on the Lake, and more! Needed a bunch of large units for an unexpected furniture donation for our school, this facility was able to accommodate us on less than a day's notice, register my units and find and apply a discount that I didn't even see online giving me even more savings! The only thing I'd note is that units must be insured and this can be an extra expense if you don't already carry renters or homeowner's. From OK-74. Exit at W Hefner Rd and follow to MacArthur Blvd. Turn left onto N MacArthur Blvd and travel South. Drive thru the light at Britton RD and past the North MacArthur Church of Christ and Stone brook Apartments. The entrance to our facility will be on the right-hand side directly across from 7 Eleven. From I-44 N exit to NW Expressway and turn left. Travel West 3 miles take a right onto MacArthur Blvd. At this intersection, you will find a CVS Pharmacy, Zaxby’s, and Starbucks. Follow MacArthur past Whataburger, Hefner Middle School, Crestwood Animal Hospital, and Landsbrook. The entrance to the property will be on the left before reaching Lola’s Family Restaurant, North MacArthur Church of Christ, and Britton Rd. Lake Hefner will limit access from the East to all but local traffic. From I-44 S exit to NW Expressway and turn right onto NW Expressway. Travel West 3 miles take a right onto MacArthur Blvd. At this intersection, you will find a CVS Pharmacy, Zaxby’s, and Starbucks. Follow MacArthur past Whataburger, Hefner Middle School, Crestwood Animal Hospital, and Landsbrook. The entrance to the property will be on the left before reaching Lola’s Family Restaurant, North MacArthur Church of Christ, and Britton Rd. Drive East on Britton Rd. Turn right onto N MacArthur Blvd. If you reach Lake Hefner, you have driven too far. Traveling South on MacArthur blvd, drive past Stone Brook Apartments and North MacArthur Church of Christ. Access to the property will be on the right-hand side directly across from 7 Eleven. If you reach Lansbrook you have traveled too far.